Beautiful ORANGE & WHITE 'Halloween-Theme' jumper dress set features WHITE KNIT TOP/BODYSUIT with PICOT TRIM at the mock turtleneck and long sleeves. 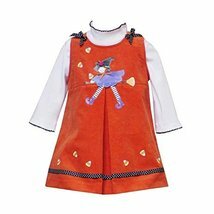 Button back ORANGE SPLIT-FRONT corduroy jumper dress features CANDY CORN & WITCH ON BROOM APPLIQUES with DOTTED-GROSGRAIN RIBBON & BOW TRIM at shoulders and hem. Machine washable. Imported. Matching/Coordinating SISTER SIZES available in sizes 12M-6X, search for style(s): RRE-11838. More 'Halloween-Theme' dresses/outfits available, search for: " baby-halloween-theme-clothes "
ORANGE & WHITE 'Halloween-Theme' jumper dress set features WHITE KNIT TOP/BODYSUIT with PICOT TRIM at the mock turtleneck and long sleeves. 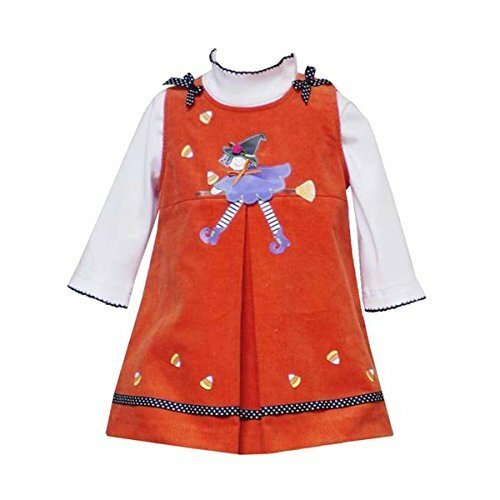 Button back ORANGE SPLIT-FRONT corduroy jumper dress features CANDY CORN & WITCH ON BROOM APPLIQUES with DOTTED-GROSGRAIN RIBBON & BOW TRIM at shoulders and hem. 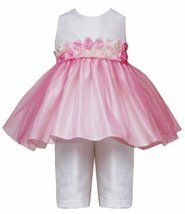 Matching/Coordinating SISTER SIZES available in sizes 12M-6X, search for style(s): RRE-11838.